“Legacy media need to put as much emphasis on transforming their organisations as they do transforming their content” – this is the premise underlying ‘Going Digital. A Roadmap for Organisational Transformation’. News organisations are struggling with technology transitions and fearful for their future. Yet a cadre of news organisations – some new, some old – has emerged who are succeeding with digital news. Why are Vice and BuzzFeed investing in journalism and why are pedigree journalists joining them? Why are established news organisations letting experienced journalists go but recruiting technologists? Why does everyone seem to be embracing native advertising? 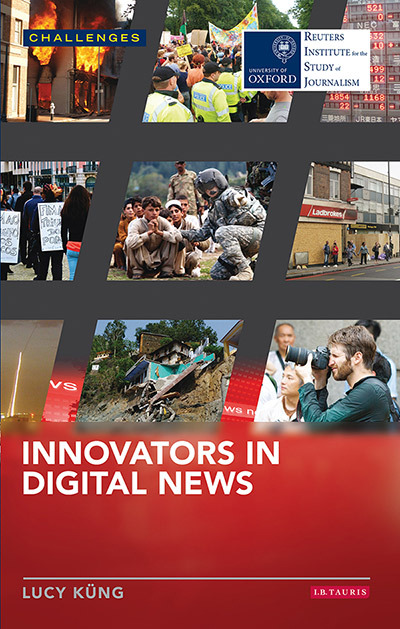 Why are some news organisations more innovative than others? This book looks at several key players in the digital news industry and draws on extensive first-hand research inside the organisations. It explores how international media organisations – including The Guardian, The New York Times, Quartz, BuzzFeed and Vice – approach digital news. How do they operate? How do they innovate? What strategies have they adopted and why? Which structures, skills and attitudes are necessary to make digital journalism succeed? How are they financing their operations? 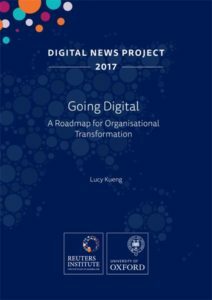 Lucy Kueng identifies and discusses the common elements that underlie these organisations’ success with digital news. While far from a universal prescription for dealing with the turmoil in the media industry, this book provides valuable pointers for how all players, legacy and clean sheet, can seize the growth potential. Kueng’s book stands out for its focus on concepts, drivers, and dynamics. Its scope and learning are brilliant and dazzling–the ascendancy of the media tech sector, the culture of digital organizations, their creative workforce, and their strategic leadership. This greatly updated and upgraded edition will be a source of insight for aspiring students and a tool for industry veterans who seek the perspective of academia. 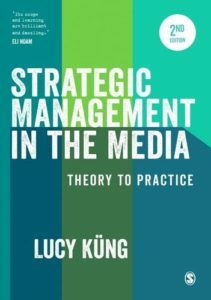 Once again, Lucy Kueng has produced the standard text in media management. Fully updated, it offers a comprehensive and accessible guide to strategic management in the media for students, lecturers and researchers. It is compulsory reading in my classes! Addresses the growing interest worldwide in the field of media management with a comprehensive, accessible and expert introduction to the practice of strategic management as applied to the media industry. It focuses explicitly on the theory and task of strategic management in the media sector and is is international in orientation, drawing on cases and examples from all over the world. New media issues are integrated with traditional media industry themes, reflecting the gradual growth of the Internet and digital technologies into the mainstream mass media and all strategic and management theory is presented within the context of the media industry. Emphasis is put on a number of strategic management concepts which are of special relevance for the media industry – leadership, business model, creativity and culture. Cases include News Corporation, Endemol, BBC, Bertelsman, CNN, MTV, Disney and Pixar. You can purchase a copy of Strategic Management in the Media Industry in most good bookshops, including Amazon. This book provides a unique insight into two of the world’s best-known media organisations during a period of great change and new challenges. Drawing on five years’ intense research among senior managers inside both organisations, it explores the beliefs and attitudes that shape management and priorities and broadcasting policy. Controversially, it examines how each organisation’s distinct cultural beliefs have laid the foundation for past success – and will determine their ability to respond to the strategic challenges that lie ahead. Available in Taiwanese (Asia Pacific Press), Korean (Communication Books), Indonesian (Kantor Berita) and Chinese (Tsinghua University Press). 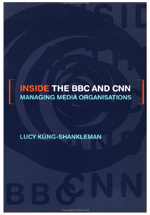 You can purchase a copy of Inside the BBC and CNN in most good bookshops, including Amazon. 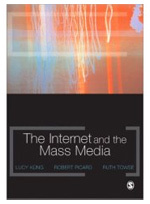 This book offers a comprehensive analysis of the impact of the Internet on media and mediated content industries. It discusses the changes this emergent communications platform is engendering for the media and content industries and the implications of those changes. Its contents are drawn from the findings of a five-year EU sponsored research initiative, the ‘Cost A20 Programme on the Impact of the Internet on the Mass Media’. Its authors include Europe’s leading scholars in the field. The chapters look at the impact of the Internet on technology, platforms and innovation, content, users, and media organisations’ strategies, structures and business models. You can purchase a copy of The Internet and Mass Media in most good bookshops, including Amazon. The topic of leadership in the media industry is a compelling one. Randolph Hearst, William Paley, Robert Maxwell, Rupert Murdoch and Ted Turner represent some of the most flamboyant leaders industry has known. But leadership is also a sprawling area of management theory characterised by ambiguity and controversy. 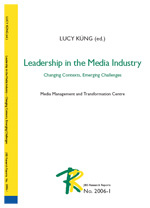 This volume presents a selection of papers from an international conference on Leadership in Media Organisations which brought together researchers from around the world. This case, commissioned by the BBC, tells the story of the launch of Freeview. This digital terrestrial television service was launched by the BBC in partnership with arch rival Sky, and Crown Castle. In the space of just six months it took over the ruins of a failed digital terrestrial platform and launched an entirely new service. Viewership increased from 600,000 homes in October 2002 to over 5 million as of January 2005. It explores the factors that enabled the BBC to establish the consortium and get the new service up and running so fast and so successfully. It focuses particularly on issues of strategy in dynamic conditions, creativity, collaborative leadership, and the marketing and branding of digital services. This case, also commissioned by the BBC, concerns the inside story behind the launch of BBC News Online, which is now the sixth most visited news site in the world. It focuses particularly on the factors that allowed an old media industry with a strong culture, long history, and bureaucratic processes to respond so quickly and successfully to the launch of the Internet. It is designed to sensitise students to the challenges of strategic change – even successful strategic change – in established firms.